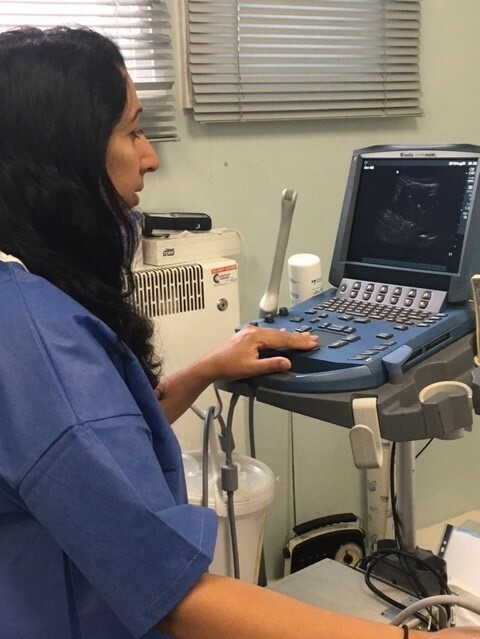 Dr. Farah Chaudhry, Consultant in Sexual and Reproductive Health for Leeds Sexual Health, West Yorkshire, describes how point-of-care ultrasound (POCUS) allows her to give informed and clear assurances to women using long-acting contraception. I spent 10 years as a GP (general practitinoer) in Leeds, developing a special interest and expertise in women’s health, in particular complex contraception. After that, I decided to pursue the specialty of sexual and reproductive health (SRH) full time. I managed the complex contraception clinics in Kirklees and Bradford for Locala Community Partnerships – an independent social enterprise providing a range of NHS services in the communities of West Yorkshire – and am now carrying out a similar role for Leeds Sexual Health. Complex contraception services are for women who experience difficulties with particular methods of contraception, mostly because of persistent bleeding, or for those who are already using long-acting methods, such as implants or intrauterine devices (IUDs), but require specialist treatment or advice. Referrals occur when community health practitioners have concerns about the location, and therefore efficacy, of a previously fitted device, for example, because the implant under the skin in the upper arm is no longer palpable. Using ultrasound, I’m able to locate the implant and, depending on its position, proceed to removal. Similarly, IUD threads can also migrate; when in situ, threads attached to the lower end of the IUD traverse the cervical canal and exit the os to allow for removal. These may not be visible to the clinician on examination and therefore ultrasound-guided intervention is required to assess that the IUD is still in a satisfactory position in the uterus to provide contraceptive cover and has not been expelled or perforated. If necessary, the IUD can be safely removed under ultrasound guidance, and a new coil inserted. Using POCUS in my contraception clinics allows me to give women definitive information. It also lets me provide guided intervention to resolve any complications, often at a time of significant concern and anxiety. Ultrasound is an invaluable clinical tool in my practice; it offers peace of mind for the specialist and, more importantly, for the women needing our support. The use of point-of-care ultrasound (POCUS) technology in Women’s Health can increase diagnostic confidence for providers, improve efficiency and decrease complications, therefore reducing costs overall. Learn how SonoSite’s ultrasound systems can make common diagnostic and interventional procedures more efficient and accurate; streamlining treatment plans and reducing patient anxiety.